One thing I know for sure, I love Topiaries. Big ones, little ones, GIVE ME ALL THE TOPIARIES! I had these little terra cotta pots that I had found at an antique store and I had yet to find a good use for them. Then a *light bulb* went off. What screams springtime more than topiaries?!?! So I set out to make a little forest of mini moss topiaries. 6 trees to be exact! I wanted this project to be as DIY as possible so I chose not to buy little round moss balls. Besides, they are always way too dark green for my liking. 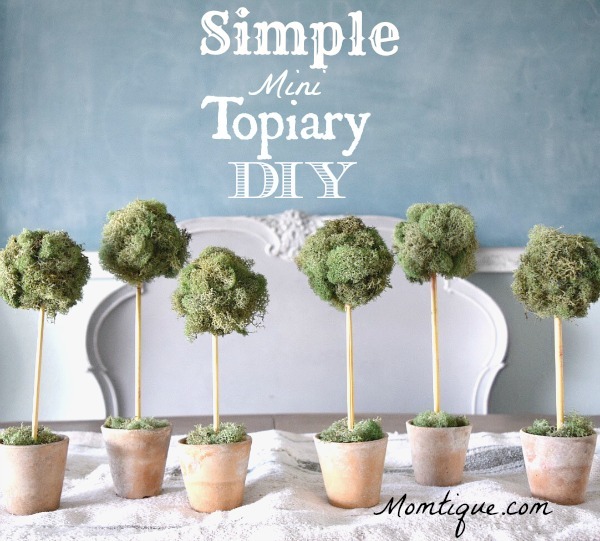 So are you ready for a VERY simple topiary tutorial?!?! First things first. Gather all the supplies. You can find all of these items at your local craft store. But if you’d rather not leave the house, I’ve included Amazon links for everything. 6 small 2.5″-3″ Terra Cotta Pots. You can find something similar Here on Amazon. 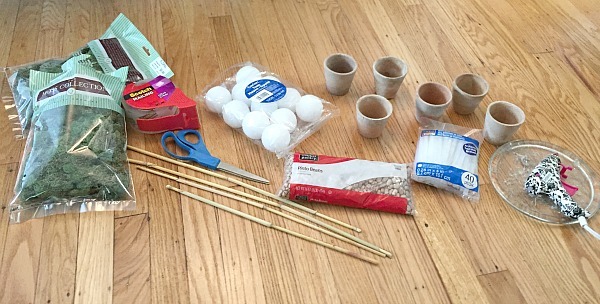 6 – 2″ Foam Balls. You can find something similar Here on Amazon. 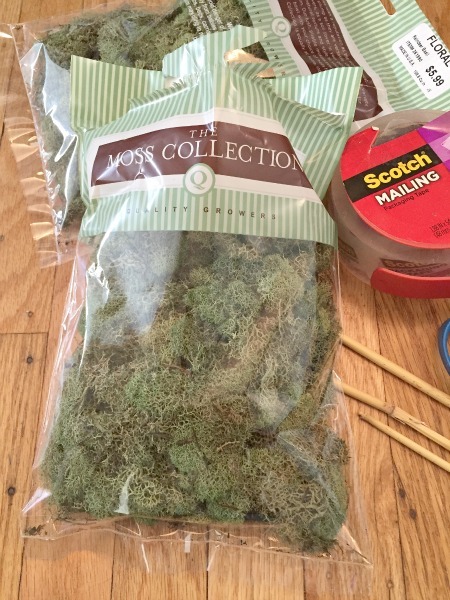 1 Bag of Moss. You can find something similar Here on Amazon. 6 Sticks (at least 8″ tall). You can find something similar Here on Amazon. Hot Glue Gun and Glue Sticks. You can find something similar Here on Amazon. Block of Foam. You can find something similar Here on Amazon. One at a time, apply hot glue to the ball. Then place the moss on the ball. Repeat until it’s completely covered. To avoid too much weirdness in shape, place the moss so it keeps a round shape. You don’t want it to look perfectly round but you also don’t want it to look like your 3 year old’s preschool project. Next you need to find the “prettiest” side of the finished moss ball. This will be the front. Grab your sticks. I used the wheat stems I had leftover from decorating for fall. It’s time to decide how tall you want your trees. Do you want them all to be the same size or 3 different sizes….you pick. I wanted my trees to be 3 different sizes. 2 of each: 8.5″, 9.5″ and 10.5″. So I cut my sticks a little bit shorter to about 8″, 9″ and 10″. Once you’ve cut your stick(s), force the stick through the bottom into the foam. Cut a piece of foam to fit nice and snug in the bottom of the pot. You are going to shove the stick into the foam and this is going to keep the stick in place. Place the stick into the foam. Depending on the type of foam, you may have to cut a little spot for your stick to fit in. Once you’ve put the stick into the foam, fill the pot with beans (this part isn’t really necessary but I didn’t want to use too much moss so I needed a filler). You are just about done! Good for you! Just cover the beans or foam with a little bit of moss. I love my little forest of mini topiaries! 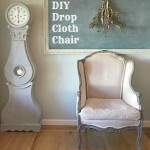 And oh my goodness, this was the easiest project. 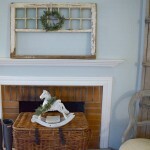 They compliment my beautiful custom monogram sign by Ava Berry Lane just perfectly. I think this is where they will stay. Thanks for joining me on this little DIY adventure! And remember to enjoy the DIY life. You did it yourself and it will probably show.